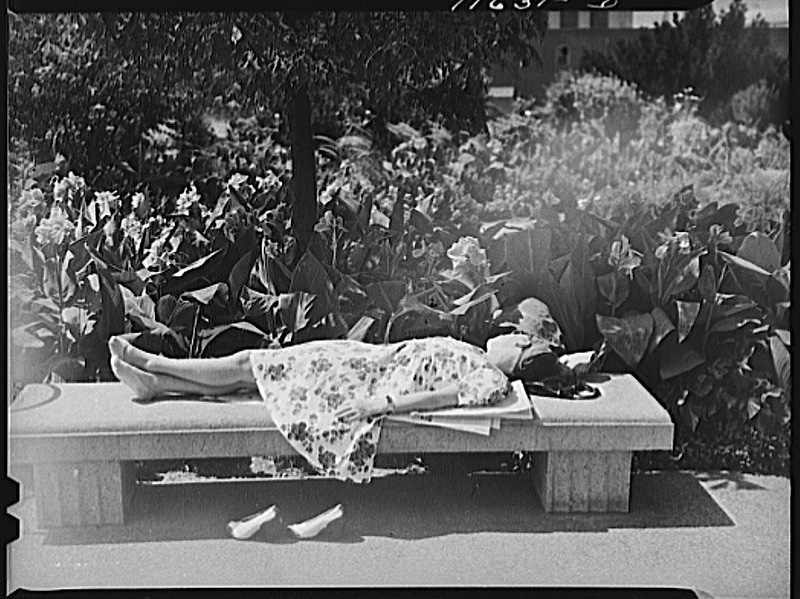 “Washington, D.C. Government employee taking a nap on a bench in the [U.S. Botanic] Garden,” September 1942, by John Ferrell, via Library of Congress Prints and Photographs Division. I can never imagine relaxing enough to nap in public, especially if you’re female. Determined napper to be asleep on concrete! Sarah, Linda, and Amy, Thanks for your comments! — which I’m very late in answering, as I spent most of September in the hospital for foot surgery, I’m afraid. I’ve read that Washington, D.C., was packed to the gills with new arrivals doing war work in the early 1940s, with people practically sleeping in shifts in boarding houses. This picture may be an example of the general exhaustion everyone felt and how they might grab any opportunity for a nap. The Botanic Garden, among the cannas, must have been a choice spot.